If you are looking to have the quintessential Costa Rica experience, consider a day in the rainforest on one of our many waterfall excursions! 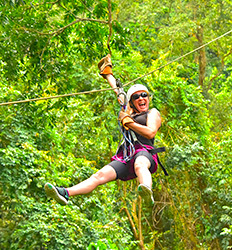 Whether you just want to go for a walk in the woods and photograph some beautiful waterfalls along the way, or you’d rather be riding a zip line a hundred feet above one, we have a wide range of waterfall tours in Costa Rica to suit all tastes. Costa Rica is a tiny country packed with a phenomenal amount of natural beauty that you must see to believe, and thanks to the massive network of rivers running through it, waterfalls of all sizes are a ubiquitous part of the landscape. Big, small, good for cliff diving, better for relaxing, great rainforest hikes combined with an ATV ride or instead maybe with a horseback ride… there are so many ways to get your Costa Rica waterfall action! All of our waterfall tour guides are professional, bilingual, and knowledgeable about the area in which they work. Where special equipment or knowledge is a necessity, trust that you will be in good hands with our guides who are in the business of making memories and making people smile. Let them guide you to some of the best waterfalls in Costa Rica! You’re already on your way to Costa Rica… what’s your next big adventure? Browse our extensive catalog of waterfall tour offerings below, and let us know if which waterfall adventure you are looking for. The Explorer Waterfall Tour deposit is $10.00 per person. Experience true canyoneering in Costa Rica on our Canyoning & Canyoning & Waterfall Rappelling Tour in Jaco. Break out your sense of adventure and bring it with you for a day of rappelling, ziplining & hiking our way through Costa Rica's rainforest canyoneering after gorgeous waterfall! 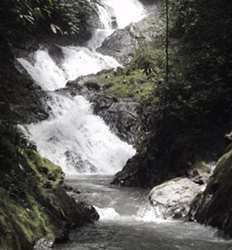 Canyoning in Jaco is one of the most popular things to do in Costa Rica. 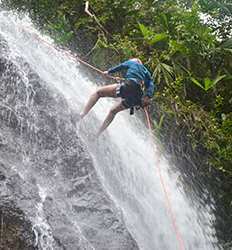 Canyoning & Canyoning & Waterfall Rappelling Tour deposit is $10.00 per Adult. This tour departs at 7:00am and 1:00pm. If you´re searching for an all-day thrill ride through some of Costa Rica´s most rugged and beautiful terrain, the Extreme Adventurer Waterfall Tour is the adrenaline boost you´ve been looking for! This waterfall excursion in Jaco offers a total of 5 different waterfalls in 3 locations, so... it´s kind of a big deal! 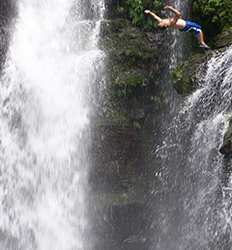 The Extreme Adventurer Waterfall Tour deposit is $25.00 per person. With a name like The Jumper Waterfall Tour.....you kind of know what to expect from this tour. However, "tranquila" is the word of the day on The Jumper Waterfall Tour. The cliff jumping part is up to you. This waterfall in Jaco is the the mellowest and most family-friendly of all the Costa Rica waterfall tours we offer! Looking for some cool things to do in Jaco but cannot decide between a zip line canopy tour, a horseback riding excursion, or a short hike to one of Costa Rica's waterfalls? Our Canopy + Horseback Riding + Waterfall hike tour combines the best of all 3 Costa Rica adventures into one super combo tour in Jaco that you will never forget! 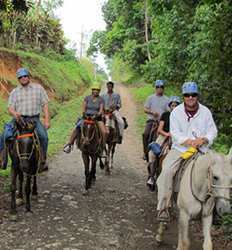 Canopy + Horseback Riding + Waterfalls Hike Tour deposit is $25.00 per Adult. This tour departs at 8:00am, 10:00am and 11:00am. Saddle up and explore the stunning natural beauty of the Manuel Antonio,Costa Rica on this family friendly, two hour trail ride excursion on horseback. The Real Deal Tours brings you the popular Tocori Waterfalls Horseback ride tour with Don Gilberto and his family at the best price in town. Tocori Waterfalls & Rancho Don Gilberto Horseback Ride deposit is $11.00 per person departing from: Manuel Antonio & Quepos. Tocori Waterfalls & Rancho Don Gilberto Horseback Ride deposit is $20.00 per person departing from: Los Sueños, Herradura, Jaco, Esterillos, Uvita, Costa Ballena & Dominical.